Home Costs > How Much Does Air Duct Cleaning Cost? According to the Environmental Protection Agency, cleaning your air ducts can help your airflow and increase the energy efficiency of your home. How much does a furnace cleaning cost? The cost of cleaning your air ducts will depend on the size of your system, the complexity of your setup and the extent of contamination. On average, be prepared to spend anywhere between $250 to $500. A residential home, if you wanted to price it per vent opening, can cost $20 to $35 per vent, with most companies charging a $100 to $150 minimum fee. What you will find out is that some companies will charge by the number of vents you have, while others will want to see your setup in person to offer a quote. If you wanted to have a commercial building cleaned, then the costs could increase by more than 50 to 100 percent, again, depending on your setup. With most jobs being straightforward, it doesn’t hurt to receive as many quotes as you can to see who offers the best deal in town. Even if you don’t have the time, that’s okay because this is where HomeAdvisor.com comes in. Here, you simply explain your job and contractors will email with free estimates. No obligation and no credit card required. NOTE: These were quotes for the air duct cleaning only. This didn’t include the price for dryer vent cleaning and/or additional services if you were to want them. If mildew was present during the cleaning, then expect to pay more for the removal on top of the estimates mentioned above since the company will have to use special chemicals, spend more time at your home and use special equipment. This can cost another $0.07 to $0.11 per square foot, on average. While most residential home air duct systems are fairly straightforward, some can be custom designed with features that are difficult to access. If your system required more time and/or added work, then this can increase the costs as well. While optional, some homeowners opt to clean out their dryer vents at the same time. this could cost another $100 to $150, depending on the location of your dryer. 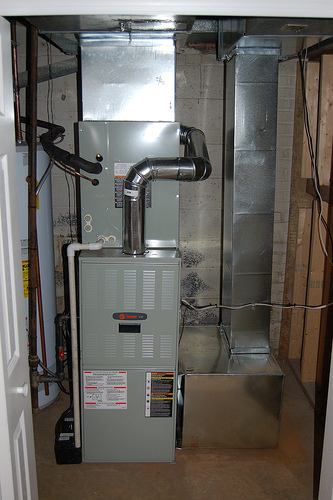 Aside from the vents, your air conditioning unit and furnace may need to be cleaned as well to improve your efficiency. Depending on the type of a/c unit and furnace you have, this can add another $15 to $100 per unit. The EPA highly recommends avoiding using a sprayed sealant or harmful chemicals inside of your air ducts. Since these chemicals can cause more harm than good, it’s wise to avoid these options if the company you were to hire offered to use them. However, if you decided you did want to use them, it could add another $150 to $250 to the costs. Asbestos, often found in older homes, may be detected during the cleaning. To remove and replace, this could cost as much as $300 to $500 per duct. Most of your modern homes won’t need an air duct cleaning as long as you change the furnace filters. However, if you continue to change the filters and notice the accumulation of dust, dirt and/or dander, then it may be a sign you need a high-pressure cleaning. One of the best ways, according to HomeAdvisor.com, is to simply check the ducts to see if you can see any indication of mold, mildew, dust or pollen buildup. If an air duct cleaning company says you have mold inside of your ductwork, it can often be a red flag. To be certain, hire a qualified mold testing firm to confirm the results inside of your ductwork. Air duct cleaning is recommended for those who recently remodeled their home, if there has been an animal infestation, visible mold is inside your ductwork and/or you start to notice pet hair or other contaminants being released into the room while the HVAC system is running. Is air duct cleaning worth it? There no evidence that cleaning improves the air quality; however, evidence has shown that a dirty heating and cooling coil, air handling unit and/or motors can affect the unit’s efficiency. When getting quotes, try to avoid the “too good to be true” offers. These low-ball offers are often falsified as it’s a way to get the company inside of your door. Once they start working, they will then scare you with upgrades, almost forcing you to pay hundreds of extra dollars to tackle a problem that may not need to be resolved in the first place. According to our research, a happy median price is inside the $300 to $500 range. Anything less should be questioned. Air duct cleaning is a very competitive field, and many of your reputable companies often offer coupons/daily deals to help you save up to 40 percent. Be sure to check out Groupon and Angie’s List to see if you can find a deal in your area. Also check the company’s official website to see if you can potentially find a coupon or special offer. Receive written estimates from at least five licensed companies in your area. Aside from these estimates, be sure to ask for references, check their reviews online and make sure the company is certified by the National Air Duct Cleaners Association (NADCA), which sets standards for HVAC system cleaning.